God is able to give us peace in abundance. God is pouring out His peace. It is up to us to come under that and take in that peace. How does the world receive peace? They may sit in a room and meditate to get peace. In the UK, we have something called as mindfulness where you focus on your body and how it works. Some people say you have to be breathing and focus on your breathing to get peace. Scandinavian people have a cult called hooger where they set fire, light candles, sit cozily with blankets wrapped around them and snuggle to get peace. Some people think they have peace when there is no war. But what does the Bible say about peace and receiving peace? Peace is not about just one part of the body. It is about the heart, body, mind, and soul. Where do we see first see God’s peace in the Bible? 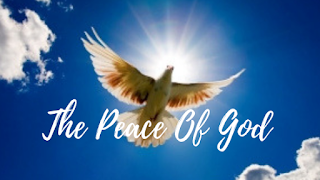 Judges 6:24 - So Gideon built an altar to the Lord there and called it The Lord Is Peace. To this day, it stands in Ophrah of the Abiezrites. Gideon needed to know that God was with him. That is when the angel came and though the circumstances were not in favor to them; Gideon sustained and stayed there because of God’s peace. Most of the times, we imagine how our prayers would be answered. But God wants to meet with you wherever you are. God knows the best. The Bible talks about a huge gap between God and us. If you try to bridge this gap, it is like putting a plaster on a gunshot wound. We do not need a plaster. We need Jesus. His fullness and wholeness. God is very much aware of this gap. Hence, He sent his own Son, Jesus, the Prince of peace. 1. Do you not know Jesus? Eph 2:13 - But now in Christ Jesus, you who once were far away have been brought near by the blood of Christ. The gap is closed through the blood of Christ Jesus. We may have many different and barriers but we are one in Christ Jesus. Jesus had gone back to his Father to be with Him. But He sent the Holy Spirit to be with us. How can we remind ourselves about what He has done for us and receive Him as peace? We do it through the Holy Sacrament. As we partake in it, we remember what God has done for us and physically we take hold of it and receive peace. We also do it through Baptism. Baptism is a physical thing to act out. We die, are buried in water and rise up in Christ. When we look back in the water, we see our old self inside the water. Phil 4:6-7 - 6 Do not be anxious about anything, but in every situation, by prayer and petition, with thanksgiving, present your requests to God. 7 And the peace of God, which transcends all understanding, will guard your hearts and your minds in Christ Jesus. Peace comes as we find Jesus. We don’t need all the answers. We come to Jesus in faith. There are many things which we don’t understand, but we are peaceful. The reason behind it is “Jesus”. The heart is guarded by peace. God wants to run after you. He wants to have a relationship with you. He wants to take you on a journey with him. If you are worrying and feeling restless, you need to embrace Jesus. 3. Are you involved in ministry? If you are involved in ministry, you need to work from a place of security. You need to embrace Jesus. From that place of security, you can go out and share with others, the gospel and peace of God.